Since I had a very slim window of time between projects, Ron and I took a jaunt to NY to see A Little Night Music on Sunday. All I have to say is what a difference a star can make ! What was previously a good-ish show now has the feeling of an event. I seemed to have liked Catherine Zeta-Jones’s performance as Desiree more than most. Perhaps it was just because I was staggered by the sheer unexpected luminosity of her presence, and the way it also seemed to eclipse anyone on stage with her. 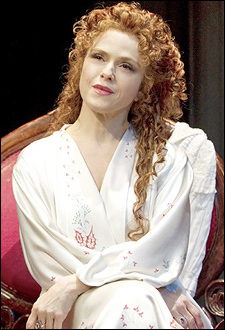 Although lovely (absolutely lovely), Bernadette Peters doesn’t have Zeta-Jones’s ravishing looks in the role, but she is simply such an icon that looks don’t matter. You are automatically riveted by her on stage. It’s amazing the mileage she can get out of the simplest phrase, and the degree of complexity she can portray in a character. Even those wild Titian tresses of hers gave a compellingly complicated performance (and served as a great sight gag in the rooming house scene). And Peters was the first Desiree I’ve ever seen to color the letter portions of The Glamorous Life with her feelings for the people she was writing to. Interestingly, Peters is also much better at sharing focus with her fellow players. Perhaps the advantage of 9 months head start, but the rest of the cast was giving really well-etched performances. Alexander Hanson is a much sexier (and randier) Frederick than I remembered and Romona Mallory’s Anne seems to have added a degree of madness to her portrayal. When I first saw this production, Erin Davie’s portrayal of Charlotte made me take it off the mental list I’ve had of actor-proof roles; somehow, she was much more winning this time around. And then there’s Elaine Stritch. Her performance was like the icing on the meatloaf. Every scintilla of theatrical intelligence told me that she was “working” far too hard in the role and every theater-loving portion of my emotion was in heaven that she was. From her first entrance when she was dealing with her solitaire game in exasperation to her final curtain call, she made every moment that she was on-stage count. There was often gratitude that she managed to make it all the way to the end of a line. And there were moments in Liaisons when she was at least a full measure behind the music. (And I’m told it was amazing to watch conductor Rob Bowman on the monitor during the number.) And most importantly, Stritch and Peters are both of the let’s-milk-this-for-all-it’s-worth school of performance, making them quite convincing as mother and daughter. One proviso — I saw Peters both at the beginning of her run in Into the Woods where she was totally engaged, and at the end when she looked really, really bored. I’d suggest catching the show sooner than later. This entry was posted on Wednesday, July 28th, 2010 at 9:54 pm and is filed under Reports. You can follow any responses to this entry through the RSS 2.0 feed. You can leave a response, or trackback from your own site. “…the icing on the meatloaf” is one of my favorite quotes ever and it is perfect for elaine stritch who could made even that delicious. YUM!! Once in a lifetime casting – glad you got to see it, unspeakably jealous that we won’t get it over here and commitments preclude a trip to NY (although Hannah Waddingham and Maureen Lipmen were wondrous in the London production), and hoping for a thrill on a similar scale from the Sondheim Prom at the Royal Albert Hall tomorrow, about which I’ll be blogging on Sunday.